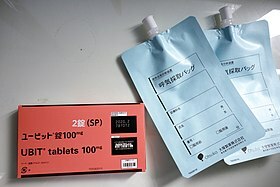 Patients swallow urea labelled with an uncommon isotope, either radioactive carbon-14 or non-radioactive carbon-13. In the subsequent 10–30 minutes, the detection of isotope-labelled carbon dioxide in exhaled breath indicates that the urea was split; this indicates that urease (the enzyme that H. pylori uses to metabolize urea) is present in the stomach, and hence that H. pylori bacteria are present. For the two different forms of urea, different instrumentation is required. Carbon-14 is normally measured by scintillation, whereas carbon-13 can be detected by isotope ratio mass spectrometry or by mass correlation spectrometry. For each of these methods, a baseline breath sample is required before taking the isotope-labeled urea, for comparison with the post-urea sample, with a 20- to 30-minute duration between them. Samples may be sent to a reference laboratory for analysis. Alternatively, mass correlation spectrometry can be performed as an office-based test since breath samples are continuously collected, and results are provided immediately within minutes. The difference between the pre- and post urea measurements is used to determine infection. This value is compared to a cut-off value. Results below the value are assumed to be negative, those above positive. The cut-off value itself is determined by comparing the results of patients with two or more different detection methods. The value is chosen that gives the best combination of sensitivity and specificity. The test measures active H. pylori infection. If antibiotics are depressing the amount of H. pylori present, or the stomach conditions are less acidic than normal, the amount of urease present will be lessened. Accordingly, the test should only be performed 14 days after stopping acid reducing medication (proton pump inhibitors, PPI) or 28 days after stopping antibiotic treatment. Some clinicians believe that a reservoir of H. pylori in dental plaque can affect the result. ^ Chey, William; Wong, BC; Practice Parameters Committee of the American College of Gastroenterology (2007). "American College of Gastroenterology Guideline on the Management of Helicobacter pylori Infection" (PDF). Am J Gastroenterol. 102 (8): 1808–1825. doi:10.1111/j.1572-0241.2007.01393.x. PMID 17608775. ^ Malfertheiner, P; Megraud, F; O'Morain, C; Bazzoli, F; El-Omar, E; Graham, D; Hunt, R; Rokkas, T; et al. (2007). "Current concepts in the management of Helicobacter pylori infection: the Maastricht III Consensus Report". Gut. 56 (6): 772–781. doi:10.1136/gut.2006.101634. PMC 1954853. PMID 17170018. ^ Shirin, H; Kenet, G; Shevah, O; Wardi, Y; Birkenfeld, S; Shahmurov, M; Bruck, R; Niv, Y; et al. (2001). "Evaluation of a novel continuous real time 13C urea breath analyzer for Helicobacter pylori". Aliment. Pharmacol. Ther. 15 (3): 389–394. doi:10.1046/j.1365-2036.2001.00926.x. PMID 11207514. ^ Israeli, E; Ilan, Y; Meir, SB; Buenavida, C; Goldin, E (2003). "A novel 13C-urea breath test device for the diagnosis of Helicobacter pylori infection: continuous online measurements allow for faster test results with high accuracy". J Clin Gastroenterol. 37 (2): 139–41. doi:10.1097/00004836-200308000-00009. PMID 12869884. ^ Peng NJ, Lai KH, Liu RS, Lee SC, Tsay DG, Lo CC, Tseng HH, Huang WK, Lo GH, Hsu PI (2001). "Clinical significance of oral urease in diagnosis of Helicobacter pylori infection by [13C]urea breath test". Dig Dis Sci. 46 (8): 1772–8. doi:10.1023/A:1010626225949. PMID 11508681.